Do you need a quick, child friendly meal? Busy parents know how hectic evenings after school can be. After picking up our bedraggled offspring, dragging their overly large back packs, with lunch smeared jumpers and playing ‘mum’ taxi to the 108 afterschool clubs most of us dread making dinner. Given the competing demands of work, commutes, schoolwork and housework dinnertime can feel like the witching hour. Trying to prepare food that children that all ‘don’t like’ different things sometimes feels like trying to complete the Crystal Maze, whilst trying to play Batman and answer constant ‘why’ questions. Once a week we have a ‘kid’s choice’ night and pizza is always a firm favourite. Chicago Town has released four NEW delicious flavours in The Pizza Kitchen Range all with tasty deli style toppings. Why not grab a Cheese Medley, Deli Pepperoni, Roasted Chicken or Garden Vegetable (packed full of broccoli and red onion!)? Frozen pizzas are a healthier and more reasonably priced choice than takeaways and these definitely pass the taste test! The classic flavours are well chosen; Peperoni and Mozzarella cheese, or the simple roast Chicken with Pepper. Yum. What are your dinner time traditions? I try and eat with my son and love family meals round the table! (Though on lap film nights on a Friday is a firm favourite.) We have a loose routine, eating around half five and we always involve the little one in preparation (as he is more likely to eat!) Screens go off and little boys has tasks, such as getting the knives and forks like a cutlery ninja and we tuck in! We love having the little girls from next door over, its pandemonium. Food and fun combined. We are not a napkins, candles, elbows off the table family. The Cheese Medley choice, a mouth-watering mix of Mozzarella, Emmental and Cheddar was by far the favourite of the multiple fussy feeders at the table. Why not munch on it plain, or add strips of ham? Usually my little man pulls ‘that’ face and leaves edges but even kids love the Pizza Kitchen crusts, as they taste like tiger bread. We are family fans of Chicago Town’s Deep Dish range but I love this thinner, crisper base. The pizzas are a generous size and are available at most major supermarkets. It looks like Tuesdays nights are now going to be pizza nights at our house! 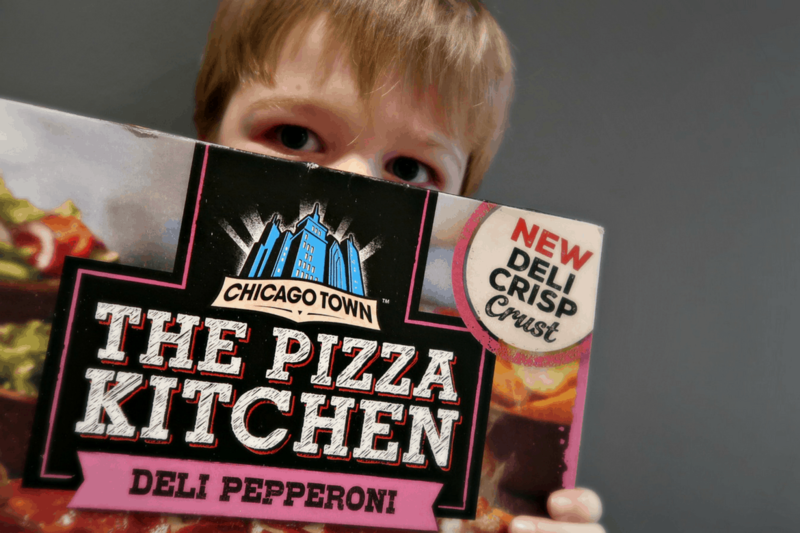 Give The Pizza Kitchen a try and soon it will be the word on every mum’s lips. I can guarantee clean plates and happy, tomato covered faces all round. What are you and your children’s favourite family meals? Are you a pizza fan and what is your chosen brand and flavour? Note: We were sent the vouchers for the pizza, all opinions and views are our own.